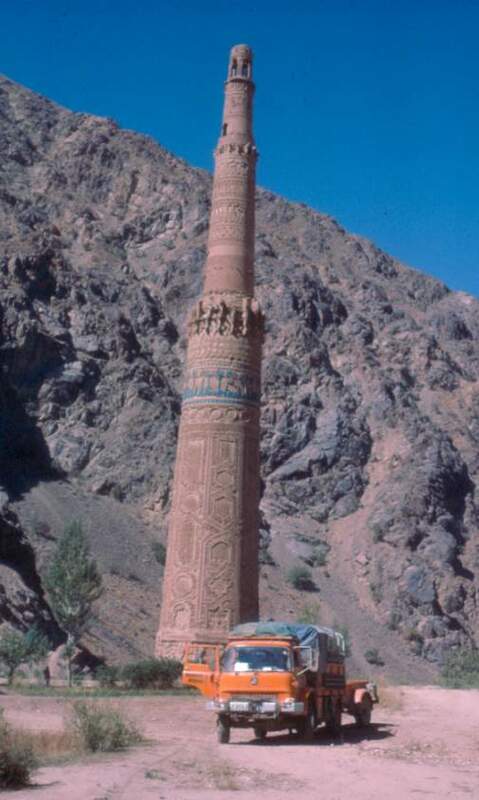 This site brings together historical material of the much loved and missed Encounter Overland. Encounter Overland was a British, trans-continental expedition company specialising in vehicle-based overland expeditions for adventure travellers. Encounter Overland was in business between 1968 and January 2001. Tony set about writing the first brochure and mounting a marketing campaign in both America and the UK, while Stuart and Rob fitted coach seating and diesel engines to the two battle-scarred vehicles and acquired another two K9’s. Five London to Kathmandu trips were operated in 1968. Expeditions ran across Asia (from 1968 between London and Kathmandu), across Africa (from 1970 between London and Johannesburg), around South America (from 1973 between Barranquilla and Rio de Janeiro) and across Central America (from 1974 between Los Angeles and Panama). Expedition durations were usually between 10 weeks and six months. Expedition Members (EMs) were aged mostly between 18 and 35 and came from many countries but primarily from the United Kingdom, Australia, New Zealand, Canada, Switzerland, Germany, Netherlands and the USA. Encounter Overland also operated many shorter duration Brief Encounters on all three continents. These generally were between three and six weeks duration for people who were not able to commit to a journey of several months. As well as vehicle-based trips, Encounter also operated treks and white-water rafting in Nepal, a trek across the Darien Gap between Panama and Colombia and for a time had a sailboat in Malaysia. 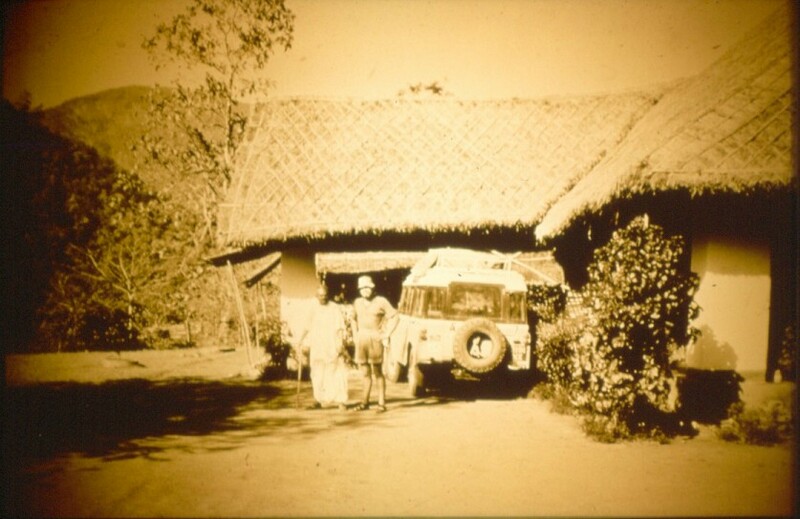 Encounter Overland was not the first company to operate overland trips in Asia or Africa. But it did pioneer the concept of four-wheel drive truck based expeditions with the flexibility to explore new places along the route which standard vehicles might have been unable to reach. Encounter Overland was the first company to operate this style of trip in South America. In 1983 Encounter Overland diversified its operations by offering Asia overland coach/hotel tours under the name Himalaya Overland. Sundowners, a long-established coach tour company which operated European camping tours and Asia overland tours, had ceased operating the previous year. 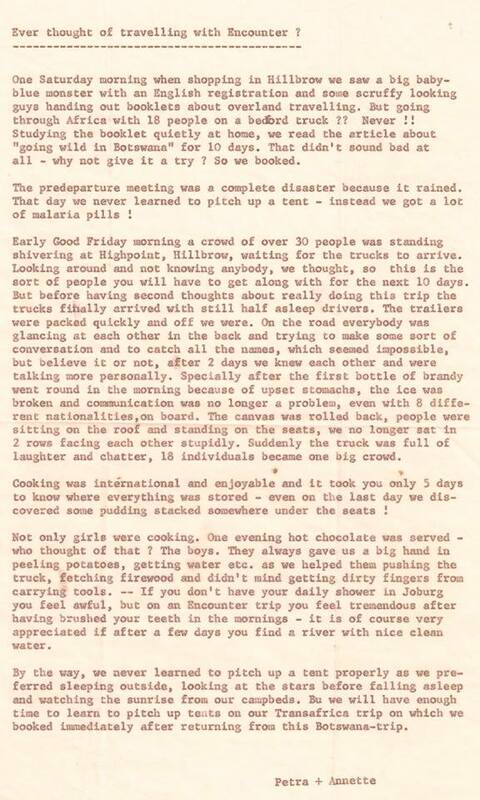 Himalaya Overland was later changed to Sundowners Overland. When Encounter Overland itself ceased operations in 2001, Dragoman acquired some of the vehicles, other assets and the name. It operated ‘Encounter‘ branded tours separate to the Dragoman product for four years. Thank-you everyone who has contributed material over the years for this collection. If you have other material which would enhance this archival record of Encounter Overland, please get in touch either using the Contact page or directly via email to Lance Thomas at 267oldbrompton@gmail.com. – for EMs: the Encounter Overland Group. There is also an ‘Encounter Overland’ WhatsApp group administered by Darren Nicholson. Send a personal message via Facebook to Darren to join the group.